India’s next museum has opened in London to commemorate a great, yet controversial statesman. On his recent visit to the U.K., Indian Prime Minister Narendra Modi and Maharashtra Chief Minister Devendra Fadnavis opened a small museum in memory of one of India’s greatest 20th century politicians, Bhimrao Ramji Ambavadekar. 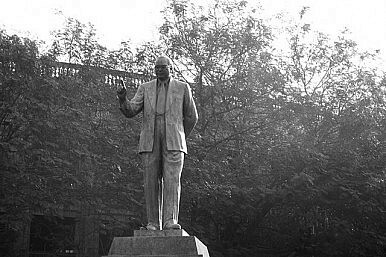 Ambavadekar (1891-1956), usually referred to as Ambedkar, was born into an “untouchable” family in what at that time was British-ruled Bombay Presidency and now is the Indian state Maharashtra. At that time it was nearly unthinkable for a member of the lower caste to succeed in life as much as Ambedkar did; indeed, it is not that common in India today. As in the case of other untouchables, his childhood was dominated by the hardships and ostracism meted out by higher castes. As it is often recalled, Ambedkar and other students of the downtrodden class had to sit outside the classroom while listening to the teacher. Despite this, the brilliant young man was able not only to complete his education but eventually scaled much greater heights than his upper-caste co-students. Having graduated from Bombay University, Ambedkar was hired by the government of the princely state of Baroda and soon obtained a scholarship from the ruler to continue his studies at Columbia University. He obtained two M.A. degrees and a PhD there, and yet proceeded to London to simultaneously study for the bar at Gray’s Inn and undertake another PhD at the London School of Economics. In the early 1920sm his residence in London was located on King Henry’s Road at Primrose Hill and it is that house that became his museum. Despite his extensive academic experience – which primarily included political science, sociology, economy and law – Ambedkar’s career suffered ups and downs after his return to India – he was still facing the same wall of social exclusion. He was more successful in practicing law but also became increasingly involved in the issue of the social and political uplift of the depressed classes. While the political associations and parties he founded never achieved larger electoral successes, by the end of British rule Ambedkar was a recognized luminary of law. As such he was asked to become the law minister of the transitory government and had a great role in writing the constitution of the Republic of India. India gained independence in 1947 and the constitution was promulgated in 1950, but soon after when Ambedkar’s strong belief in secularism and progressive solutions unsuccessfully clashed with political votaries of Hindu conservatism and nationalism, the disenchanted law minister quit his post. He never achieved a high political position later but continued to be the most vocal national leader of the depressed classes. Close to death in 1956, Ambedkar came to the conclusion that as the caste system and untouchability are an integral part of the Hindu faith there is no point or fighting them from within. As a symbolical gesture of political and religious defiance he and a number of his followers (mostly from his caste, the Mahars) publicly converted to Buddhism. This and a number of other, earlier steps served as examples of his boldness for the untouchables but were also highly disliked by many members of the high castes, as well as Hindu conservatives and Hindu nationalists. When Ambedkar’s former residence on King Henry’s Road went on sale, it was the government of Maharashtra, not the government of India, that decided to purchase it. The building was eventually acquired in September this year. Apart from displaying some of Ambedkar’s belongings and papers, it is supposed to house two students from India at a time, who are to be provided scholarships. It should not be surprising that a person who contributed so much to the Republic of India should be remembered even in London, and it seems fair and logical that his house should be open to Indian students. What can raise eyebrows, however, is who bought the building and is fostering Ambedkar’s memory there. Ambedkar ceased to be law minister in 1951, being unable to push through the Hindu Code bill that would change and unify the personal law of various Hindu communities. Apart from being of a unifying nature (but not including the Muslim and Christian communities), the bill was progressive in spirit, striving to put Hindu women on par with Hindu men in terms of marriage, guardianship, inheritance, etc. The vehement opposition to the bill came from the conservative section of the ruling Indian National Congress party and the Hindu nationalist Bharatiya Jana Sangh party. A few years later the bill was divided into four small ones and gradually voted into law, but Ambedkar was already out of the government and at the very end of his life. It must be added, however, that the Hindu nationalists came to terms with the new Hindu personal law but insisted that it is unfair to keep the Muslims out of its purview. The same Bharatiya Jana Sangh party went on to become the Bharatiya Janata Party (BJP) in 1980. And it is the BJP which is now ruling both India and the state of Maharashtra and it is its government that has now purchased Ambedkar’s Primrose Hill residence. One may assume that if Ambedkar had had a say in appointing a custodian of his former house, he would not have opted for Hindu nationalists. A deceased leader’s legacy can be claimed, abortively or successfully, by virtually everybody. As long as he is alive, the leader may clearly show his affiliation to a given party, faction, association, and so on. But as more and more time passes and memories fade, it becomes more difficult for his heirs to keep his entire fame to themselves. This is what is now happening to the architects of the Republic of India. The great builders of the young independent India – Gandhi, Nehru, Patel and Ambedkar – differed on a number of profound issues. Gandhi shared Ambedkar’s distaste for untouchability but insisted that it is a corruption of Hindu mores rather than an example of their essence. The progressive Ambedkar wanted to annihilate not just the untouchability but also the institution of the caste itself, while the more traditionalist Patel and Gandhi would have preferred to eradicate the former but retain the latter. The position of Nehru, the prime minister of India, was closer to that of Ambedkar but he proceeded with greater caution than Ambedkar and confronted various social and religious practices in a much more selective way. While Patel and Gandhi where religious Hindus, Ambedkar and Nehru were not, yet Ambedkar chose to convert to Buddhism which the agnostic Nehru would never do. The seclusion and indeed persecution of untouchables has deep roots in many Hindu traditions and certain classical texts. Therefore, Ambedkar chose to publicly burn one of those, the Manusmriti, in public, a dangerous act that is sometimes repeated by his followers to this day. This act was abhorrent to both Gandhi and Patel. Can a single party claim the legacy of all of these leaders? Nominally, Gandhi, Nehru and Patel belonged to the same party, the Indian National Congress, but in practice they represented three different ideological strands within it. Ambedkar was a specialist in law but a political outsider. While he remains the icon of scores of untouchables – or Dalits, as they often prefer to be called nowadays – his immediate successors are too weak and divided to secure his legacy. Nominally, his legacy should be first of all claimed by the Republican Party of India, the last party founded by Ambedkar, but that outfit remains marginal and has suffered numerous splits. The Dalits lack an all-Indian powerful political platform to speak from, although numerous regional parties, such as the Bahujan Samaj Party in Uttar Pradesh, speak of Ambedkar with veneration. The Indian National Congress remains the most important party of the Indian opposition but is currently facing one of its biggest crises. Bharatiya Janata Party, in turn, is at the peak of its popularity. The Hindu nationalists are already doing their best to claim a stake in the legacy of Vallabhbhai Patel, the one Indian National Congress leader who had been particularly soft on them at the end of his life. The BJP government in Gujarat is dedicated to fulfilling the mammoth task of building the world’s largest statue (representing Patel) and Prime Minister Narendra Modi has long ago flagged a Unity Run in Patel’s name. Although it was a Hindu nationalist (but with a somewhat different affiliation) who assassinated Gandhi, since 1960s the Hindu nationalists have claimed to be in agreement with Gandhi’s philosophy. Since its inception in 1980, the BJP claimed Gandhism as part of its political ideology. The socialist and agnostic Nehru is the last figure the Hindu nationalists would like to praise, but even in his case a few stray conciliatory remarks have been made. Ambedkar is a rather newer addition to the political pantheon of Hindu nationalists, but hardly a surprising one. The BJP had longed strived to shake its image as a mostly Hindu upper-caste party. The last elections of 2014 clearly show that in many areas it has succeeded. Its broad victory clearly shows that it was accepted by huge numbers of middle and lower classes alike, and scores of intermediate and lower castes. To retain this position it will be essential for the BJP to increasingly engage with the Dalits and make reference to their political icons. It is even more logical to pursue such a strategy in Maharashtra, where Ambedkar lived and where he is remembered by his community, the Mahars. It is therefore even less surprising that it is the government of Devendra Fadnavis that bought out the London residence. Bhimrao Ambavadekar remains as passionately loved by some as he is hated by others. The controversies that surround his memory show how much opposition there is in India to the bolder forms of Dalit assertiveness and progress. Recently, a Dalit was brutally murdered for playing a ringtone from a song about Ambedkar in Maharashtra. In another fresh event, a figure of the untouchable leader was vandalized in Punjab. Earlier, a long movement to get Marathwada University in Maharashtra named after Ambedkar was often resisted with violent riots before it eventually succeeded. Therefore, while it may be historically ironic that it is the Hindu nationalists that are now opening a Ambedkar museum in London, it is at least reassuring that a government, whatever its ideology, is taking yet another step not to ignore, but to strengthen the memory of the champion of the downtrodden classes.